Big Jon you screwed up your game royally, I'll see you in the jury soon bud! Big Brother Spoilers > Big Brother Canada > Season 2 > Big Jon you screwed up your game royally, I’ll see you in the jury soon bud! Big Jon you screwed up your game royally, I’ll see you in the jury soon bud! 8:50am – 9:10am Arlie heads downstairs and sits on the couch by the kitchen. He then goes over to the living room couch and falls asleep for a few minutes. He wakes up does a few laps around the backyard and then heads upstairs to the bathroom. 9:15am – 9:50am Big Brother wakes up the other house guests. Arlie heads into the bedroom and says good morning. I snuck in my second all nighter of the season. I may try and sneak in a nap right now though. Heather goes to check if the tv screens are displaying the Eviction Day sign. She says that it isn’t. Jon comments that there has never been a morning when it hasn’t been on the screen. Neda says oh no! If there is some kind of twist that is f**king stupid. Neda goes to the bathroom and tells them it doesn’t say live eviction. Neda asks Adel you didn’t self evict did you. She asks him if anything weird happened last night? Adel says no. Neda heads back to the bathroom. Rachelle says if he stays I am going to f**king freak. Neda returns and says that she feels a lot better now that the sign in on the tvs. In the living room – Allison, Jon, Rachelle are talking. Rachelle says I can’t wait to find out why you came in 2 weeks later. They talk about how they thought she was Canada’s player. Allison says I am not Canada’s player, I make my own decisions. They comment on how its not fair that Big Brother is letting Arlie sleep right now but that they can’t. Adel comes inside and he says he is so tired. Sabrina asks why did you stay up so late? There’s HOH tonight! Jon says it was Arlie’s last plan to keep you up. Sabrina asks Rachelle and Heather if Arlie did that for them. He thinks Neda is useless. Why would he try to f**k him (Adel) from winning HOH? Sabrina tells Rachelle to go in the havenot and try and sleep too. Rachelle goes in and lays down. Not long after big brother wakes them up. 10:30am – 10:45am IN the bedroom – Neda talks to Adel. She tells him oh my gosh don’t do that. Don’t do anything! Everyone is already decided. Everyone was so fired up about Arlie last night. Everyone is voting him out. Neda says we were all talking last night about all the things he’s done. He was the one that was coming to tell Sabrina that we were all mean people. Neda leaves. Sabrina joins Adel and she tells that Arlie kept him up all night so he would lose HOH. Adel asks I don’t know why he told me to pack all my bags. Adel says what the f**k is he doing. Why did he tell me to pack everything. Sabrina says don’t pack all your things, you’re fine. Adel tells her that the if he wins HOH he will put up JOn and Neda. Sabrina says you do whatever you want to do. Arlie joins them and says he doesn’t understand why then want him to be exhausted. He says I think they think me being exhausted will make me do something crazy.. Big Brother blocks the live feeds. When the feeds come back Arlie is talking to Adel about how he honestly thought BB would let him get in a couple hour nap. Adel says I’ve never been so exhausted. Adel says I got an idea .. hot tub .. its sunny out we could sun tan .. we need sunglasses. They start to get ready to go and big brother blocks the feeds again. 10:55am In the bedroom – Neda tells Jon that Adel told her this morning that he was going to blow up Jon’s game during the eviction. Neda tells JOn that she told him not to do it. Jon says that he’s going to talk to Adel. Neda tells him not to because I wasn’t supposed to tell you this. Jon says I don’t care. Neda tells him to talk to him in a bit. Sabrina joins them and asks Neda who she would put up if she won HOH. Neda says Heather and Adel. Sabrina asks so you wouldn’t use the veto. Neda says no. Neda says that Adel is sketching me the f**k out. Sabrina leaves. Neda says I am never getting their votes (Sabrina/Rachelle) in the end. Jon says me neither. Lets just make it so we’re both at the end so that they have to vote for one of us. Neda asks if I win HOH and have to pick whos on slop who should I pick? Jon says pick the people that haven’t been on it… Me, Heather and Adel. Neda asks you? Jon says that’s the best decision for the game. 11:15am – 12pm Allison, Sabrina, Heather and Neda are in the main bathroom talking about random things. Jon heads to the bedroom with Neda and he tells her what he could say to Adel. He says he would say why would you think of throwing me under the bus when it’s going to be a 5-0 vote. Neda tells him to be nice when he talks to him. Jon says I will, I’m not going to yell at him. Neda says I thought Adel was smart but he’s not. Jon says he is so dumb. The girls continue to get ready in the bathroom and Jon moves out of the HOH room. Sabrina is so happy that Arlie is going home today and that she is the last of the first five. 12:10pm Big Brother gives the house guests the 4 hour warning till the rehearsal for the live show tonight. If you’re enjoying the live feed updates this season, please consider donating. Simon and I work 24/7 all season long to keep you updated on everything that happens inside the Big Brother Canada house. Any amount is greatly appreciated! Your donations go directly to paying the fees required to run this site. I’m not sure you know what a psychopath is, but if he was one he wouldn’t be showing any emotion over being put on the block, whereas in this case he’s clearly very upset. He would also be campaigning a lot more aggressively than he is. LL, he was taking care a different bodily function. So slide along with your crap. I’ll miss his blue eyes :( I guess it’s too late for a twist to save him huh? I do agree with a previous comment that he would be better on the saide show, better then Peter and Gary put together! Not glad about the edit of the previous episode. Who’s stupid idea it was to make the episode all about Jon & Neda vs. Arlie, when in the feeds it was actually almost fully about Neda vs. Allison via Jon and just a tiny bit Neda vs. Arlie via Jon. It was an important part of the storyline they completely ignored just to manufacture this longgoing rivalry. On the plus side it was great to see Jon show his coward side, when he couldn’t even look Arlie in the eyes or get 2 words out during the stupid backstabbing. I really like Arlie :( feeling so bad for him. But love Adel too. Wanna see Alisson leave Next! Production has given her a lot of opportunities. Huh I wouldn’t be surprise if I see the Emmet-Jillian twist is also given to her. I think she’s a relative of someone in production & the game is fix for her to Win !!! The only thing they “gave” Allison was one week of immunity when she first came in the house. She found her veto fair and square. Both Neda and Kenny checked that flower pot before her but walked away. She kept looking. Good for her for not giving up on that one. And with the Emmett/Jillian thing, Allison is actually leading on the poll on this site so it looks like people posting here want her to be picked as well. Again, not production. Calm your jets and stop blaming production for every move that might not go the way you want it. Ann it is true that others had similar opportunities to find the first clue to the secret veto. However her stint in the war room gave her an advantage over the others on deciphering some of the clues. (That point is a bit irrelevant). However, Allison has gotten golden edits on all the shows and a lot of DR airing time when she has done little within the game. The last episode in which her drunken meltdown was not shown was a key factor within the back dooring of Arlie. However any indication that she was the target was snuffed. So this, coupled with her being portrayed as a player with some skill/strategy is definitely a frustration. Ann how you think that production has not given her anything. She came 2 weeks late, so without anything she went 2 weeks far in the game. Then she was given a weeks immunity. Then this veto ….lmdao Ann. How you think that she got no help. She’s getting help to win the game. Ann you will not see this as you’re the possible relative of Alisson. Allison’s search for all the clues gave production plenty of time to plant the reward. Do I think it was interchangeable depending on which person found? For sure! Allison was given a clear advantage! Can OBB actually confirm that Neda and Kenny checked the plant before Allison? Because it could have just been edited that way. Ha production has been helping Neda and John with the weird showing Neda the secret room and let her spy. They should shut up about this show being rigged. To be fair BB Canada is the most rigged BB of all. Last year they wanted Gary to win but thankfully one dumb girl messed that up. They screwed the first 5 royally and then they screwed Alison. I want Neda on the block, not because I’m a supporter of Gremlins as she screed sloppy seconds big time & she needs a lesson. Go Adel! Am I the only one who doesn’t care about the emmet/jillian twist? I thought that the third twistos twist would be a huge advantage, something that would give someone a real power. Not a chit-chat session with someone, who in my eyes, didn’t even really win big brother. The first two twists are vetos that help peoples game, this next twist is definitely anti-climactic! Ya I can’t wait till they are put up next! (sabs and allie)—then they will realize they really f-d up by not keeping Arlie! I agree, she wouldn’t even have won if someone had not cast a wrong vote. Those 2 have nothing to offer, what advice are they going to give, be in a showmance? Heather or Neda hopefully will win HOH tonight. Time to get rid of Sabrina or Allison. Too bad Kenny and Jon ended up on opposite sides. As a Team was the only way those two were ever getting to final 2 against all those crazy girls. I will miss Arlie and his eccentricity. I agree with those who think he’d make a great side-show host. I loathe Peter in that role! That love-fest around the dining table yesterday felt a bit weird and contrived. Poor Heather striving so hard to say something kind about Sabs! It totally reminded me of when I was a kid and my five siblings and I were having a particularly bad spell of not getting on, my mother would make us all sit together at the table and we were not allowed to leave until we had each said something nice about the other. We joke about it now but at the time! I wonder if production put them up to it? Sabrina’s edits have improved somewhat recently because I think production have realized that she actually has a chance of winning, and they want SOMEONE in Canada to like her! I hate Peter on the side show as well. What a literal douchebag! They turn off the audio to save on bandwidth fees because its cheaper for them to stream the feeds without audio during the night when they’re sleeping and nothing is happening, unfortunately we lose out on some conversations because of it. Maybe it’s just my TV but sometimes on live eviction night it’s hard to tell who is the bigger drag queen between Arissa and Gary. Big Brother, you guys make a lot of money, can’t you possibly make the poor girl look a little more feminine!! !… please! Thanks for finally talking about >Big Jon you screwed up your gwme royally, I’ll see you in the jury soon bud! Why on earth would they put poor Heather on slop again? Jon, fine he wants to volunteer but then Sabrina needs to be on it, and Allison, cuz it’s only fair she wasn’t last week. Or Adel instead of Allison because he was also not on it. Agree — Sabrina needs to be put back on slop without Rachelle! I think everyone afraid to put Sabs on it!? Random but I absolutely hate Peter on the side show! He’s a literal douchebag. 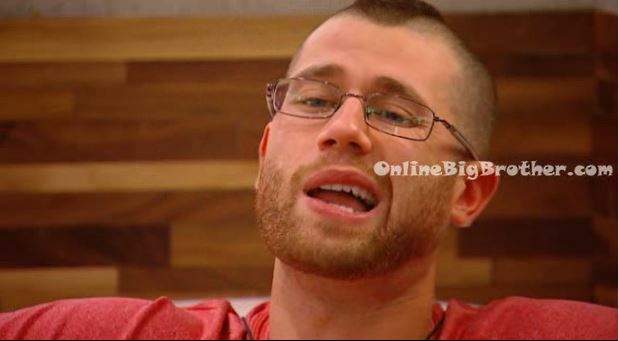 Big Brother Canada, fire him please. I think it’s BS they’re sending Arlie home over Adel, Adel doesn’t even seem concerned about winning. Arlie deserves to stay over Adel. Slobby, Canada is deeply disappointed that we have to keep looking at you. You are delusionally self absorbed. With Season 2 being a HUGE step up from Season 1, lets hope they step up the SIDE SHOW next year too. Way better characters and charismatic personalities this year. Peter and his wanna-be Dr Will, Dan, pro-wrester persona needs be banished to obscurity. Him an Alec are such try hards, and it just comes off as extremely weak. The only people who would be fans of those guys are total losers. i was starting to like sabrina when she was helping out arlie. now that she betrayed him i hope she gets bullied in this house for the remainder of her time because that is what makes her suffer most. dumb skank. Why does everyone think Arlie is nuts? What did he do so bad? Its funny how some of you are as easily influenced as The gremlins and allison! (their game is done if the don’t keep Arlie–they are blowing a perfectly great opportunity!) I can’t believe how dumb Allison is! (I thought Allison was a super-fan and knew the game??) I am disappointed I actually voted her into the house! So, they were all ‘misted’. Does anyone know why in the world would they put Jiliian and Emmett as a twist..They had no game!..Emmett was a baby and didn’t win anything in the end, and all Jillian did was make out with Emmett..That twist will boring and useless. What are they going to coach about?? ?they have and had no game!!! Jillian won by a voting error!! did anyone see the exit interview from Andrew on utube….such an assclown…he tried to make excuses about being rude and abrasive and picking his nose..by saying that we should be locked in a house and see what we do!! Assdrew I live in a house and I don’t pick my nose!!!!! Gary is the WORST. Peter at least entertains to some extent. Gary is a do-nothing-not-funny-bore. Please no more sideshow ever, or twists of any kind, or Canada (production) interference. This “game” is a joke. As are all y’all opinion. All your base are belong to us. Shhhh…hush nawww. Blah! Arlie is more concerned about walking around naked than he is trying to think of ways to stay. He’s just a “gimmick queen,” that’s all, he’s no great Big Brother mastermind, or strategist, his schtick is trying to get people to think he is, he has no real ammo. NEDA SAYS—-arlies game a rip off from other people???? NOT TRUE!! !—-please I would love for arlie to go to the war room to have a chance to get back in the game!!! I’m glad Jon pulled the trigger on this move now, rather then wait have Arlie pull the trigger on him. Now as long as neda or heather win hoh, that’s a week of him not getting his hands dirty. Arlie is annoying as hell, and as hard as it is for some of you to see, this is the biggest game move by a player to date. He didnt let fear take over and then not make a big move for his game. If I was in his position I’d do the same, and if he got me, I’d give him his kudos. This games about winning not friendships, a lot of players forget this. Why the heck aren’t the gremlins and Alison keeping Arlie! He could be more beneficial for them than Adel. Arlie has the ability to actually win competitions. Plus, since neda and Jon backdoored him, he won’t obviously work with them anymore, whereas Adel is in their alliance, no.?? If could be Arlie, Sabs, Roro, Allison vs. Jon, heather, neda. Plus Jon can’t even play hoh today, so Arlie could win it. Just a thought. Sabrina thinks Arlie took a bite of a burger and says he should get a penalty vote against him.